One of the two biggest PSD2 deadlines mandated has been and gone without without anybody really raising an eyebrow. More importantly, March 14 passed without the compliance of 41% of the European banks. Many will point fingers at those who failed to comply. But what it really highlights is that despite deep pockets and plenty of resources, the demands that PSD2 places on banks are monumental. The 14th March was the deadline for all banks to provide a testing environment – or “sandbox” – for third-party service providers (TPPs), so they get a chance to test the APIs that banks expect them to use once the big 14 September deadline arrives. A majority of the biggest European banks opened up their sandboxes on time. But what the results of this race to the interim 14 March deadline really show is that banks of all sizes are struggling to deal with short timelines in order to satisfy a wide range of needs – their own need to be in control of the data; the TPPs need to have access; and the politicians’ need to have a fair market environment in the timeline they’ve laid out. For the 41% of the banks that didn’t make it, the consequences could hurt. There are penalties laid out by the European Banking Authority (EBA) for those who miss the deadline. Those in breach of the law will have to provide a fallback mechanism (aka direct access) – a costly investment on top of the dedicated interface (think: API) that the banks have been pushing for – so TPPs have another way to access accounts and perform payment initiation services. Those who fail to fulfil the requirements could face an audit and prosecution by national authorities. These penalties are severe because the banks who don’t comply are essentially inhibiting TPPs from offering aggregation and payment initiation services – and bank customers from taking advantage of these services. And because once it was decided this was the direction we were all going with PSD2 – toward better consumer protection, more innovation and more competition – we all became dependent on each other to get there. For TPPs and Open Banking platform providers, the missed deadline also potentially means disruptions to their businesses and customers. After all, they are all required to use the bank’s dedicated interface by 14th September deadline. And if they can’t get access and start testing them, then it forces them to continue to rely on the fallback mechanisms that are in place – rather than the open APIs the banks would prefer they use. Everyone involved in Open Banking is heavily invested in realising the future we all envision for the industry. And the knock-on effect of a missed deadline is big – for banks, FinTechs and for consumers. The already arduous requirements will be compounded with additional ones designed to penalise. The costs will increase as the timeline stretches out. And it will hinder everyone’s ability to offer better services to consumers. There’s also a risk for missing the big deadline in September – and for this paradigm shift, that was meant to happen now, to take much longer and cost much more. The data shown here was taken from a surveyed by Tink of 442 European banks across 10 markets (Germany, Spain, UK, France, Belgium, the Netherlands and the Nordics) on March 15. It found that 59% had made their PSD2 testing environments available on time, while 41% had not. The 442 banks that we surveyed cover more than 90% of the consumers in each of these 10 markets. 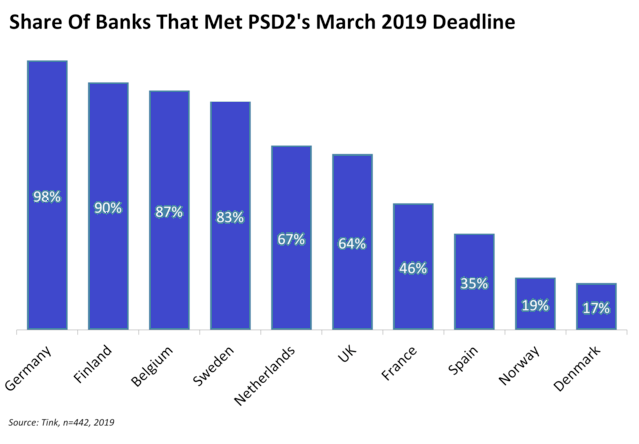 The post Why so many banks missed PSD2 deadline and what are the consequences appeared first on Payments Cards & Mobile.